This item is 1080P 2.0MP IP camera, it equipped with 24 IR LEDs, 1/3inch CMOS sensor and IR-CUT double filter. Which provide very clear day and night vision.The motion detection, phone APP control, waterproof functions make it popular used in shops, offices and other needed places. *2.0 Megapixels CMOS Sensor, 1080P high definition. 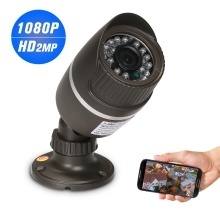 *4mm lens with 24pcs infrared lamps, night vision distance up to 30m. *Motion detection function. The camera will be triggered to record when detect something moving. *Multiple ways to access on the PC and mobile phone, can be viewed by PC client, browser, and phone APP.